This is the “fine print” page where all those boring (but very necessary) details about our sessions and money are published, just in case. If you have any questions just call us at (808) 262-6979, or email us at contact@fitforagoddess.com. within 6 months from the end of the date of the session in which you missed class(es). No rollover fee applies for instances of injury or illness. A 50% deposit is required to book a private class. The balance is due at the time of your lesson. Private lessons are $80/hour. In consideration of your instructor’s schedule and others who may want the same time slot, 48 hours notice is required to cancel/reschedule your private class, or the deposit will be forfeited. Within 48 hours notice, the deposit may be transferred towards another private class. A 50% deposit is required to book a party. The balance is due at the time of the party. Private parties are $350 for the first 10 women ($25 for each additional 5 ladies). In the event that you must cancel your party, the deposit/payment may be transferred, in the form of a gift certificate, toward classes or a 1-hour private with one week’s (7 calendar days) notice. 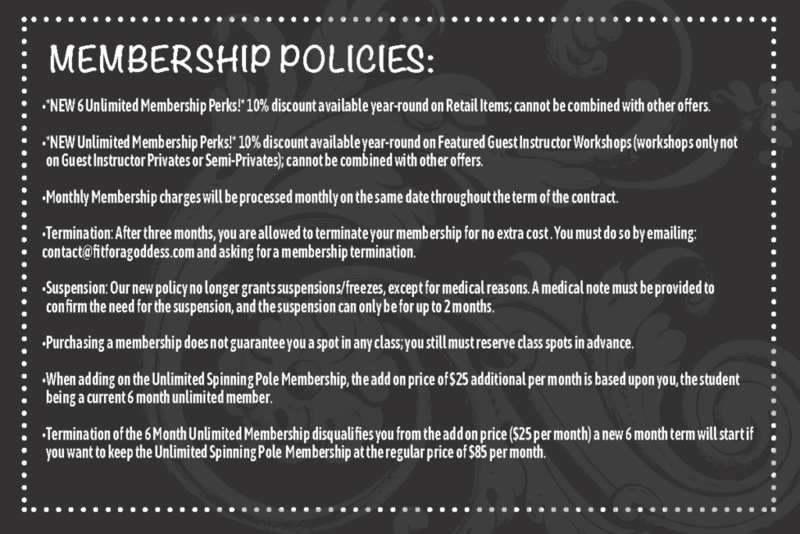 In consideration of your instructor’s schedule and others who may want the same time slot, parties canceled or rescheduled with less than one weeks (7 calendar days) notice will forfeit deposit/gift certificate. In the interest of safety, anyone who appears to have had “one too many” may be asked to “assume a spectator role” (not nearly as much fun) for the evening. If you need to schedule a make-up class, please check the class availability. You can request to make-up in a particular class, if there is space available. Please be aware that class size will be limited to 15-24 students (depending on the location) and make-up spaces will be on a first come, first serve basis. On the flip-side, please call if you know you will not be able to make your class; this will open a space for another student to do a make-up class. Arrival and departure times We ask that you are considerate of other students and arrive a few minutes prior to your sessions’ scheduled start time. You may depart at any time once the session has started but you cannot make-up the class time should you choose to depart early.